Dr. Maki Iwase is an Assistant Professor in the Teaching Stream at the Lawrence S. Bloomberg Faculty of Nursing. She teaches in both the undergraduate and graduate nursing programs. Her pedagogical praxis draws upon her clinical background as a home care nurse and diabetes educator. Her scholarship is informed by critical social theory and feminist anti-racist literature and activism. 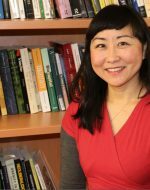 Iwase’s ethnographically-informed doctoral study examined the social effects of gestational diabetes in ‘high-risk ethnic groups’ in order to elucidate how contested categories of disease, risk and race cross-articulate in authoritative texts, clinical practice and in everyday realities of women of colour. Iwase brings theoretical ideas from social sciences and the humanities to bear on knowledge production, pedagogy, and clinical practice. She encourages students to acquire the skill of critique and grapple simultaneously with the knowledge of problems and the problems with knowledge in order to open up alternative possibilities in practice. She is the recipient of several teaching awards, including the 2016 Undergraduate Teaching Excellence Award and 2015 Equity and Diversity Award at the Lawrence S. Bloomberg Faculty of Nursing. She has also been nominated for the 2015 Toronto Star Nightingale Award and recognized as a HealthyU Community Champion at the University of Toronto.